Latin America (LATAM) is one of the current hot areas for growth. The market is large, fragmented and has complex currency and regulatory controls. At the recent Money20/20 conference, LATAM was one of the key geographies companies were interested in. Below we look at total trade for each country against the country’s total inward remittances to give a sense of the opportunity both for business and consumer focused providers. Mexico is by far the largest remittance and trade opportunity, driven primarily by its proximity and ties to the US. Brazil stands out from a trade perspective but offers a much smaller consumer opportunity. 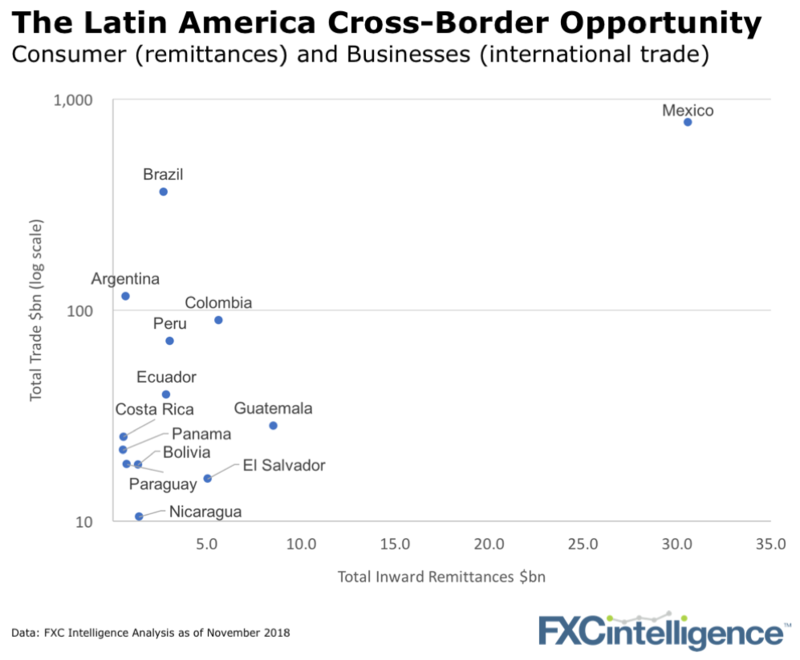 For most of these countries outbound remittances (not shown) account for less than 10% of their inward sums, with Brazil the largest outbound market. These market sizes provide guidance as to who should consider entering a market and the product set you’d need to offer. 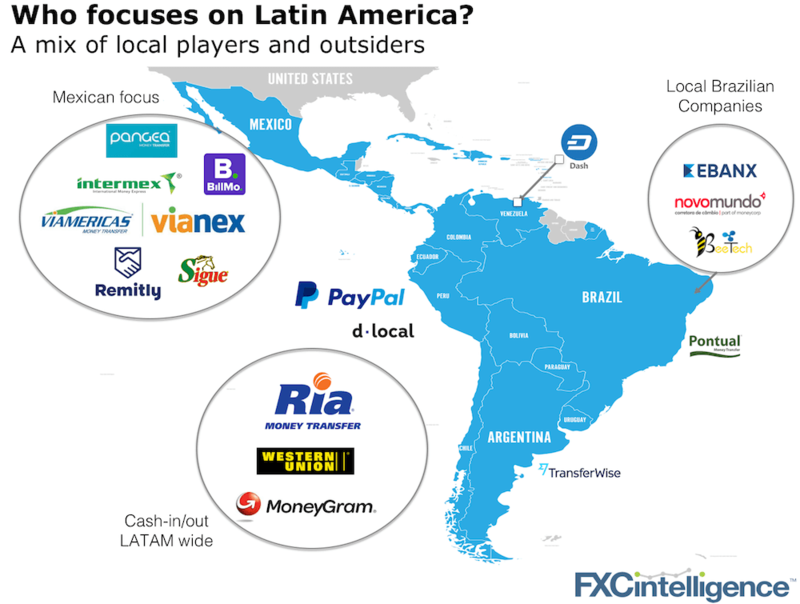 The LATAM market can be split into three groups: 1) Local market players EBANX and dLocal lead the payment processing market. Their local market knowledge and ability to significantly reduce the failed payment rate (as opposed to foreign or international focused peers) has given them a significant advantage. 2) External players investing in a local player There are not many examples of companies taking this path (e.g. Moneycorp and Novo Mundo). The M&A process and regulatory due diligence means these transactions can take years to complete. 3) Non-LATAM players operating directly the market The big traditional remittance players can all be found in the market. But after that, driven by the market size shown above, Mexico has been the primary target for smaller players. For example, BillMo, based out of Connecticut in the US, has focused squarely on wallets and bill payment in the Mexican market, a strategy we discussed with them 18 months ago. They have also built relationships with local merchants, which has been critical for their success. There is no question that the economic and regulatory environments of LATAM provide challenges but also opportunities for those willing to take them on. The crypto-currency Dash, for instance, has surged in Venezuela by offering an alternative to their hyper-inflating currency. Which means if you are looking for growth opportunities and are prepared to jump over a few more hurdles than normal, Latin American could be the next market for you.